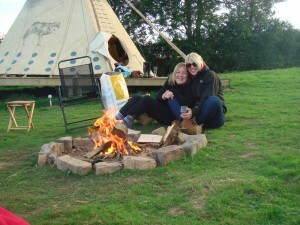 Experience the magic and tranquility of tipi living. Enjoy a unique closeness to nature in your traditional Sioux dwelling. We have tried to make the interior as snug and cosy as possible with faux fur rugs on the floor and bean bags and cushions for you to sit relax. For this reason we respectfully ask that you do not wear shoes when inside. Most of your time (UK weather permitting!) will no doubt be spent outside; so we provide a picnic table and outdoor bean bags for your al fresco comfort. 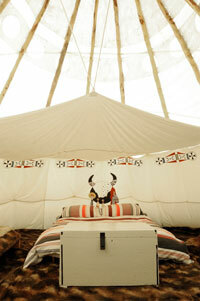 Your tipi sleeps 4-6 people (depending on the mix of children/adults.) and is furnished with a full sized double (futon) bed complete with a feather topper, duvet, and pillows and linen. In addition we provide two further single futons/air beds, also with a pillow, duvet and linen. Additional blankets are also available inside the tipis. We provide all your cooking equipment and utensils, incl. bbq, corkscrew and a kettle for that all important first morning brew! 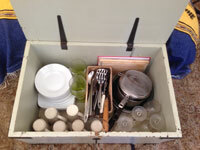 All cutlery, glasses, pots and pans are included, minimising your packing and the equipment that you need to bring. Also refer to our page on What’s Provided for a detailed list. With your cooking utensils/equipment provided you can concentrate on what treats you wish to enjoy around the campfire, and little luxuries to make your stay as memorable as possible. For the ultimate campfire breakfast and a perfect start to your day, we also sell our home produced, free range sausages, bacon and eggs. We have 2 wonderful pubs within 1 ½ miles both serving excellent food and real ales. If you cannot tear yourself away from relaxing in your new home each tipi has a cool box and we also provide a small fridge at the toilet/showers for keeping your provisions cool. Take a look at our What to Bring page which gives recommendations on items you may wish to pack. As there are other guests on site (many with young children) and in the interests of our neighbours, we do not allow loud music. We are happy for music to be played on personal IPods or musical instruments (i.e. guitars) but we would ask you to respect other guests and keep your music and noise levels to a minimum, especially in the evenings. Thank you.